This post appeared previously in the Pilot News. My commute is not this strenuous. Last week I started riding my bike to work. My bike, a Raleigh, is a sedate 21-speed built for cruising with a nice wide, soft seat that bounces gently when I encounter uneven pavement. A rack on the back holds my lunch and other sundries. One reason I bike to work is to get fitter. A full-time administrative job requires me to sit a lot. As I age, I know I have to stay active if I want to stay healthy and strong. It’s just a couple of miles from my house to my office at the Recycle Depot, about a twenty-minute ride at my usual leisurely pace. I get to work, and I also get a workout! Another reason I’m biking is that it just seems practical for short distances. I once spent a day wandering around Paris, and while taking in all the sights and sounds of that great city, I began to notice all the people on bicycles. 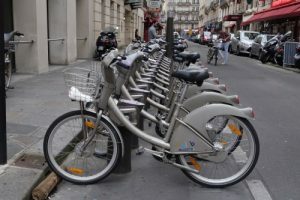 Paris has one of the best bike-sharing programs in the world: almost every block has bike terminals available. Parisians in business suits and skirts pedaled by, zipping in and out of busy Paris traffic. I was intrigued. In my world, people wore Lycra and Spandex when they rode bikes. I loved the practicality of hopping on a bike for a short trip to lunch or to an appointment. For a long time, I was hesitant to try bike-commuting myself. Being on a bike means being exposed to the weather, to other vehicles, not to mention inquisitive German Shepherds. Not being a world-class cyclist myself, I had a terrible feeling that I would collapse from exhaustion halfway to work and have to call a cab–or an ambulance. Another complication: the route to my office includes one of the busiest roads in town, which lacks a bike lane or even a shoulder. After thinking about it for a while, I decided that I could overcome these obstacles (and I would have to take my chances with any German Shepherds). I am definitely more exposed on a bike, but I make sure to wear a reflective vest when I cycle, as well as a helmet. I obey the rules of the road and ride with traffic. My physical endurance worried me, but I remembered those Parisians cycling in their suits, and it dawned on me that every ride was not the Tour de France. So I ride at a comfortable pace. On cool days, I have noticed that I barely break a sweat. On hotter days, I plan to bring a change of clothes and extra toiletries in case I need to freshen up. Bike sharing in Paris., France. Busy, crowded streets are dangerous for bicyclists. Before I rode to work for the first time, I drove a couple of routes to see which one had the best road surface, the most shoulder, and the least traffic. My ride takes me through quiet side streets for the most part, and I’m careful to cross the busiest streets at a light. I love riding my bike; it makes me feel like a kid again! Pedaling through the neighborhoods of Plymouth is like being an explorer in my own town, because I notice something new every day. 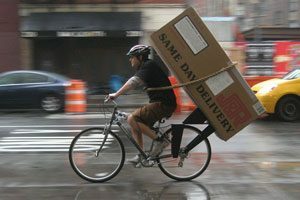 Besides the fun of riding my bike, though, there are compelling environmental reasons for choosing to commute on a bike. Obviously, biking uses no fuel other than human muscle. By contrast, fossil fuels create carbon dioxide, a gas that contributes to global warming, and automobile exhaust emits toxic substances that pollute the ground, air and water. Can bicycling actually make communities healthier? In my next column, I’ll explore how bike-friendly communities can not only promote cleaner air and healthier people, but boost local economies, too.